These Clip In Hair Extensions have been highly requested and after a year of development based on valuable client feedback we are happy to announce that we have listened!! 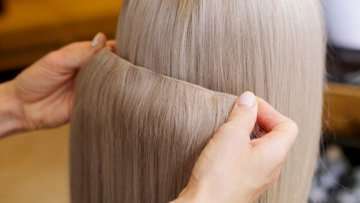 With this combination of sizes of wefts you can build your own set that suits your head shape, your own hairstyle and your styling needs. However, we have also made sure that there are still fewer pieces to fit in total compared to other clip in extensions available. We offer a free service in the salon where we can match a set of clip ins for you and also fit them, cut and style them for you. If you come to us we can build you bespoke set of clip ins that will then last you for many years!